Homeschool curriculum publisher, Memoria Press, generously sent us these American History packets for free: The Story of the Thirteen Colonies & the Great Republic Set, $48, and 200 Questions About American History Set, $27.90. This American History curriculum targets children in grades 5 through 8. It covers the most salient events in American history since pre-Columbian times. It begins with an account of the natives, who have inhabited this land long before the Europeans arrived. Then it steadily goes from the Vikings’ brief American encounter in 1012, all the way to the Spanish American war in 1898. I do want to let you know, Memoria Press is a Christian Publisher, and a quite popular one! Since ours is a secular homeschool, we shy away from religious products. Still, I find some of Memoria Press’ materials are secular in scope, and thus, fine for us to use. In fact, we’ve used several of their ancient history, sciences, and penmanship books which we’ve enjoyed quite well. This American History curriculum is yet another excellent product. 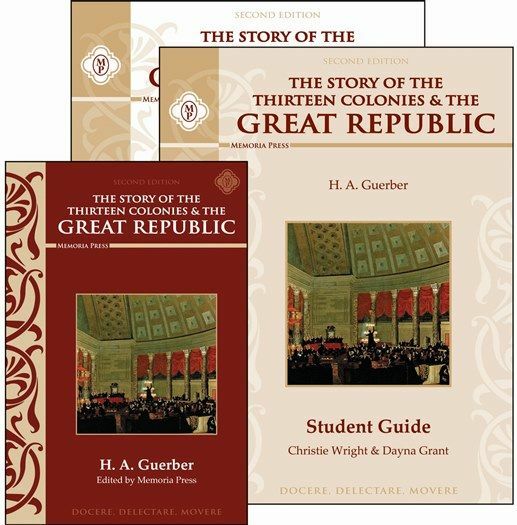 Memoria Press edited and condensed two of H.A.Guerber’s classics: “The Story of the Thirteen Colonies” and “The Great Republic” into one tome for middle schoolers. Guerber’s book appeals to Super Hero particularly because each chapter is short, one to two pages, tops. I will let him read the textbook by himself, which he’s eager to do. One, because he loves history, and two, because Guerber’s textbook is not really a textbook, it’s more like a story you want to keep reading. We are partial to the Facts to Know. Such neat salient points at a glance make them easier to remember. Super Hero usually hates filling in vocabulary words. So I didn’t require him to do the vocabulary in the workbook. Instead, we keep a ‘word jar’ which we feed with little word cards constantly. Then we play hangman or scrabble-like games with those from time to time. I have mixed feelings about the comprehension questions. I understand it makes sense to test the child’s comprehension, but I fear answering a long list of questions turns a wonderful reading into a dry and tedious exercise. Instead, I ask him to narrate his reading and then write it down. If he doesn’t get the most important points across, I use the questions as a guide. So, they are certainly helpful. The 200 Questions about American History are fun! They combine well with the Guerber book. They include drill questions, timeline, notable quotes, and an enhanced list of U.S. presidents. I put them in a bright tin can that I can carry around. It seems we’ve used them most in the kitchen while preparing dinner. Super Hero will drill me, then I will drill him. We play guessing games, and even included a few more of our own into the mix. What do I think of H.A. Guerber’s The History of the Thirteen Colonies & The Great Republic? I do like it, but I’m not madly in love with it. 😉 I enjoy the readings, they are concise and engaging. However, I’m not sure if I always want to follow them up with written vocabulary, reading comprehension questions, and compositions. I’d like to see history spiced up a bit more. Aside from the maps and timelines, how about literature, activities, artwork study of the era, a video (documentary or reenactment), or a craft now and then? I really like the 200 Questions About American History. These are fun! Everything’s already put together for you in handy dandy game cards, aka flashcards. Can’t go wrong with these as a supplement to any curriculum! If so, there’s plenty more reviews from my fellow Crew members. I love reading reviews. They’re so helpful in guiding me toward outstanding curriculum or materials that I wouldn’t know otherwise. Or to help me stay away from things I know wouldn’t fit our homeschool.